Newark, NJ — Today, New Jersey Governor Phil Murphy signed landmark legislation into law that will grant access to state aid at public and private colleges and universities for New Jersey Dreamers. The law will permit qualified students to apply for aid starting in the Fall 2018 semester, making New Jersey the tenth state in the nation to offer state financial aid to DACA and undocumented students and one of only a few states to allow students who attend private schools to also apply for state financial aid. The bill’s signing comes after a more than five year long effort organized by New Jersey Dreamers with the support of community organizations like Wind of the Spirit and Make the Road New Jersey, the ACLU of New Jersey, New Jersey Policy Perspective and the Latino Action Network. 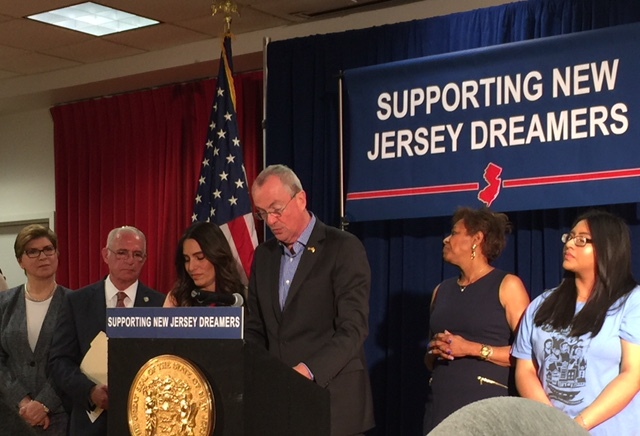 The bill’s signing completes the New Jersey Dream Act, which passed in 2013, and allowed Dreamers who have attended and graduated from high school in New Jersey the right to be considered for instate tuition rates. Governor Christie vetoed the part of the bill that would have given Dreamers access to state financial aid back in 2013. Under the law, a student demonstrating financial need who has attended high school in New Jersey for at least three years, graduated or received an equivalent diploma from a state high school and enrolls and files an affidavit with a New Jersey college is eligible to apply for any student financial aid program administered by the Higher Education Student Assistance Authority (HESAA) or the Secretary of Higher Education. Last month, the New Jersey State Legislature, led by Senator Teresa Ruiz and Assemblyman Gary Schaer, along with Senators Sandra Cunningham and Nellie Pou, and Assemblywoman Annette Quijano and Assemblywoman Mila Jasey, took a historic vote in support to expand access to financial aid to New Jersey’s undocumented students and DACA recipients. Immigrant youth, legislators, educators, allied organizations such as Make the Road New Jersey, Wind of the Spirit, New Jersey Policy Perspective, ACLU New Jersey, New Jersey Alliance for Immigrant Justice, Latin American Legal Defense and Education Fund, American Friends Service Committee, Faith in New Jersey, Latino Action Network joined to celebrate the vote. In the wake of ongoing federal attacks on immigrant young people, including President Trump’s decision to revoke the DACA program, states have had varying responses. The Arizona Supreme Court upheld a decision to bar DACA recipients from instate tuition. A seven state coalition, led by Texas, is suing the federal government to end any remains of the DACA program. Today, New Jersey has made a bold move to support DACA recipients and undocumented students. “Today New Jersey has taken a bold step to stand up for undocumented students like me at a moment when the federal government would rather deport us then see us graduate from college. We thank Senator Teresa Ruiz, Senator Sandra Cunningham, Senator Nellie Pou, Assemblyman Gary Schaer, Assemblywoman Annette Quijano, and Assemblywoman Mila Jasey for their leadership, and Governor Phil Murphy for his long-standing commitment to defend Dreamers,” said Erika Martinez, youth leader at Make the Road New Jersey and high school senior. “This legislation recognizes the difficult financial burden undertaken by many New Jersey families to achieve a college education. More importantly, this legislation acknowledges the aspiration embraced by DREAMers to provide a better life for themselves, their families, and our own state. The enactment of this bill, which will cost each taxpayer 17 cents per year, is an investment not only in the economic future of New Jersey, but an investment in all of its citizens.” said Assemblyman Gary Schaer. “Advocates and student activists have been fighting for years to secure a meaningful opportunity for immigrant students to pay for college. When all of our young people have access to higher education, our communities grow stronger,” said Dianna Houenou, Policy Counsel at ACLU of New Jersey. “This day is the culmination of 15 years of struggle,” said Frank Argote-Freyre, Chair of the Latino Action Network Foundation. “We can all rest easier today knowing that more students will - for the foreseeable future - have greater access to a college education. Their horizons are considerably brighter than they were yesterday. This is a victory for knowledge over ignorance." “Rutgers AAUP-AFT is proud to have supported this legislation since the original Dream Act was approved in 2013. We commend the sponsors, legislative leadership and Governor Murphy for their vision and perseverance. It is long overdue and all of the advocates that have fought hard over the years are to be applauded –students, alumni, faculty, and our labor and community allies. Our students benefit directly, but we all are impacted in positive and meaningful ways when opportunity is available to all,” added Patrick Nowlan, Executive Director of Rutgers AAUP-AFT. “When policies at the federal level have purposely and systematically excluded immigrants in our communities, New Jersey stands up. Our state legislature is showing the country that immigrants are valued in our state. Access to statewide tuition assistance is a huge win that will lead to the development of new leaders, diverse representation, and increased GDP. This win is not only for immigrants, this win is for all New Jerseyans,” said Adriana Abizadeh, executive director of the Latin American Legal Defense and Education Fund. Absent the passage of the DREAM Act or other breakthrough in immigration policy, ensuring equal access to financial aid will allow students to finish college on time and decrease dropout rates. New Jersey follows the lead of nine other states, from bright blue California to deep red Texas, creating a national movement that will empower immigrant youth through education, as college access is vital to Dreamers’ ability contribute to their families, their communities and the future of this nation. The legislation is a key step to making New Jersey a fair and welcoming state, in addition to expanding access to drivers’ licenses and ensuring the state does not aid in mass deportations.